Wishing for the one of a kind taste of a Lucky Wishbone hamburger, fries and soda for lunch. But it's a long way from California. Waitresses are ready to take your order, and by the way, they serve it up fast. It's still a favorite place for Anchorage-ites to go and have a great meal. When I was a sophomore and my brother Norman was a senior at East High School we drove down in our 1968 Camaro and had a wonderful after school "snack". Hamburger, fries and a soda. Norman and I would talk up a storm and enjoyed our snack before going home for dinner. 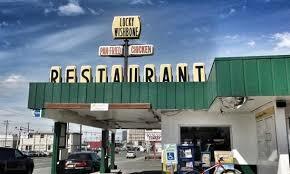 Later on, another fun memory was when my husband Mike and I would bring our daughter Nikki and son Chris to The Lucky Wishbone on Saturday after the movies. Nikki and Chris would order the children's burger. One of the best things they both liked was sitting at their own table. Mike's favorite was a cheese burger basket with fries, soda and a wonderful strawberry shortcake for dessert. Mine was always the same. Hamburger, fries and soda. Those were memory making days for me and Anchorage's Lucky Wishbone will always have a special place in my heart.. Say...I wonder if Mike's hungry for a hamburger lunch now? I know I am!